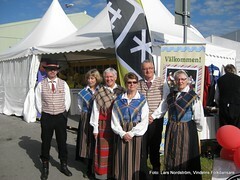 Swedish Folkdansringen, (normally we just say Folkdansringen), was founded 1920 and has more than 350 groups all over the Swedish country. 13.000 members pursue activities covering the original folk culture, mainly focused on dance, music, traditional costumes and handy crafts. Read more about Folkdansringen in Wikipedia. Upper Norrlands District includes 13 associations in Norrbotten and Västerbotten. In the district, we are almost 600 members. Read more about Norrbotten or Västerbotten in Wikipedia.